A community group dedicated to creating sustainable websites. This group will not publish specifications. Conversational Design deliverables look a LOT like a Ux user storyboard, scenario, or Customer Journey. Conversational Design supports those without visual screens, which includes IoT devices like Alexa. But it also supports, in theory “smart” web spiders and related AIs trying to make sense of a web page, if they can also engage in a dialogue with the Site Persona. Conversational Design will be used heavily in VR and AR. The reason? VR and AR environments are too complex to control except via voice interaction. So, I’m suggesting that instead of “Mobile First”, “Conversation First” as a new route to Web Sustainability. Thoughts? Here’s a link to all things Sustainable Web Design on Mightybytes’ website. As of Feb 2014 we have 19 posts on various aspects of web sustainability and a guide for developing sustainable digital products for anyone who might be interested. A good summary of Sustainable Web Design principles. From this and with additional work we can compile a standardized set of assessments to rate sustainable Web. 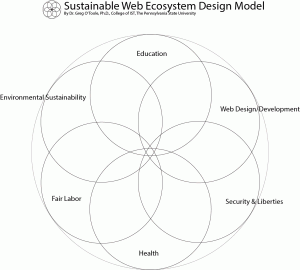 I am working out the model for improved sustainable Web ecosystem design model. 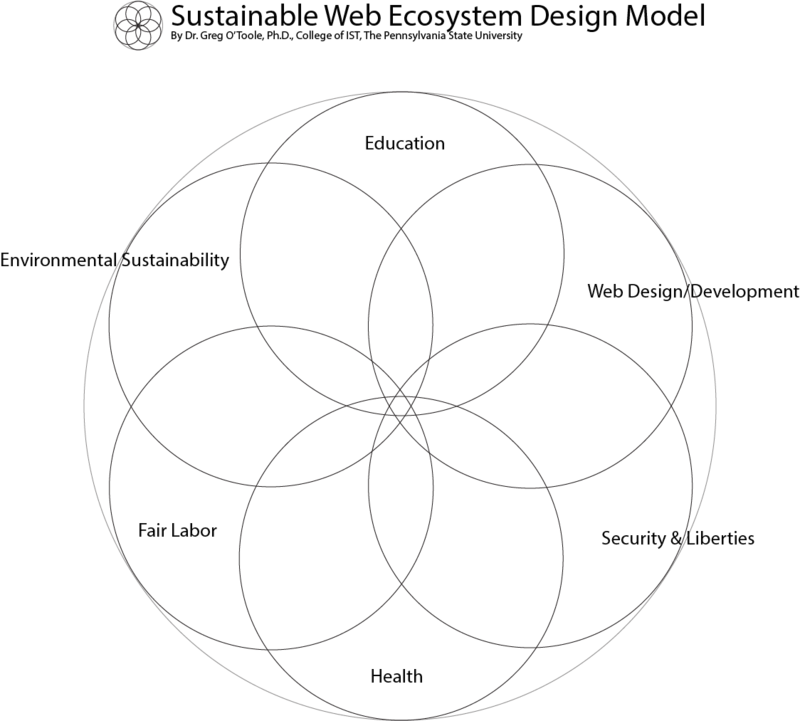 All, just wanted to share the latest version of the Sustainable Web Ecosystem Design (SWED) model that I am using for edition 2 of my book. This is also being used as instructional material in the class I teach at Penn State, IST 250.